A third-minute goal from Graham Geraghty helped Meath have a relatively untroubled afternoon at Dr Cullen Park as they beat Carlow 1-17 to 0-12 in their All-Ireland SFC first round qualifier clash. Joe Sheridan kicked an early '45' and then set up Geraghty for a fine finish past Carlow keeper Gerry McGill. Meath were 1-10 to 0-06 clear at the interval with Carlow fortunate to still have 15 men by that stage – centre-back Joe Byrne was seen to punch Geraghty but the incident went unpunished. Carlow's top scorer Simon Rea had a goal-bound shot saved by Brendan Murphy in the second half. Late points from Daithi Regan (0-02) and Charles McCarthy (0-03) copper-fastened the Royals' victory which was a richly deserved one for the effort shown. Seneschalstown clubmates Sheridan and Geraghty were on top of their game in the first half as the Carlow defence struggled to contain the pair. 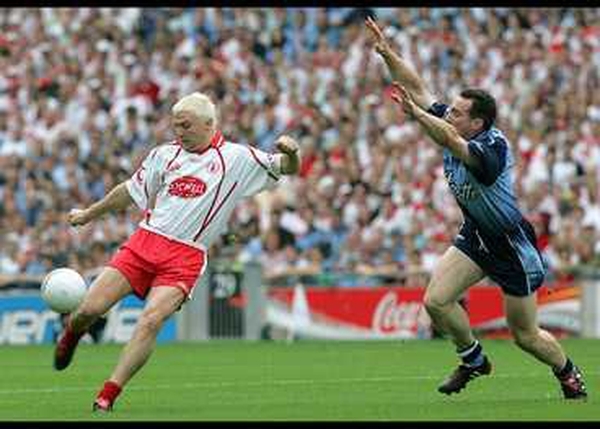 Named at centre-forward, Sheridan was swapped in to full-forward and he made Mark Brennan, a very good defender, look ill-at-ease under the high ball. Playing with the aid of the wind in the first half, Meath opened well and seemed determined to put in a performance after their Leinster exit against Wexford. Sheridan kicked three points in the first half, Mairtin Doran (0-02), Brian Farrell and Geraghty were also on as Meath burst clear for a 1-07 to 0-04 buffer. 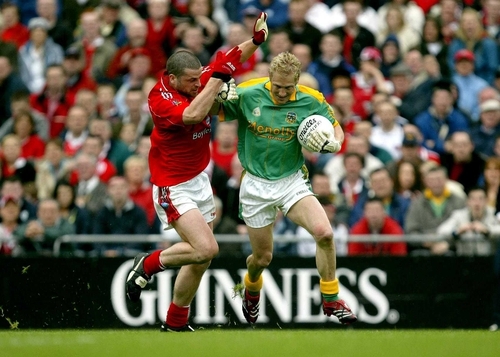 Geraghty fell to the ground on 20 minutes when Byrne was seen to strike out at the 1999 All-Ireland winning captain but referee Aidan Mangan kept his cards in his pocket. Carlow were living off frees from Patrick Kelly and Rea, who added an excellent '45' just before the half-time whistle, while Thomas Walsh opted to point when a goal looked on. Caoimhin King, Regan (free) and skipper Nigel Crawford pointed again for Meath who ended the half seven clear. Carlow opened a rain-hit second half in good stead with two points from Rea plus an over from substitute Trevor Smith. Points from Regan and Sheridan negated Carlow's charge and Murphy's excellent form under the high ball kept the Barrowsiders at bay. Substitutes McCarthy, who impressed with three points, and Ray Magee also got off the mark to ease Meath home in front of an attendance of 8,322. Carlow's disappointment was doubled when they finished with 14 men. Trevor Smith was dismissed for his second bookable offence in the closing moments. Carlow: G McGill; J Ryan, M Brennan, B Farrell; J Hayden, J Byrne, B Hannon; P Walsh (0-01), T Walsh (0-01); B Carberry, A Kelly, P Hickey (0-02 (2f)); S Rea (0-06 (4f)), M Carpenter, B Kelly. Subs used: J Kavanagh for Kelly (30 mins), T Smith (0-01) for Hayden (33), J Fitzgerald for Carpenter (35), D Byrne (0-01) for Carberry (43). Meath: B Murphy; S McGabhann, K Reilly, C King (0-01); N McLoughlin, A Myles, S Kenny; N Crawford (0-01), M Ward; P Curran (0-01), J Sheridan (0-04 (1 '45')), G Geraghty (1-01); D Regan (0-02 (1f)), M Doran (0-02), B Farrell (0-01). Subs used: J Donoghue for King (half time), C McCarthy (0-03) for Ward (42 mins), R Magee (0-01) for Curran (52), O Murphy for Geraghty (53), S McEnaney for Kenny (63).